It is sort of like ethnographic research for the campfire. Indigenous filmmaker Warwick Thornton invited Australians to submit stories about their interactions with the spirit world as part of a larger oral history project with an aboriginal focus. However, the results were not always as spooky as he expected. 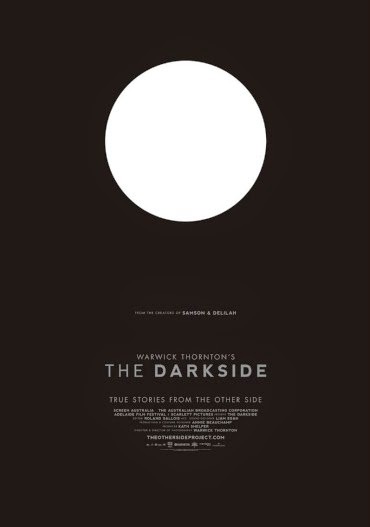 Family and loss are the primary themes of the thirteen tales re-told by screen-actors in The Darkside (trailer here), Thornton’s documentary by monologue, which screens during the American Museum of Natural History’s 2014 Margaret Mead Film Festival. Like nearly every anthology film, Darkside is a bit uneven, but Thornton, serving as his own cinematographer, always gives his static shots a warm eerie glow befitting the subject matter. By far the scariest story (and the one most riveting to watch) chronicles the tragedy wrought on the narrator’s family by a cast-off Ouija board. Occasionally, Thornton breaks format, as when he pans and scans the darkened corridors of the National Film and Sound Archive. Another more traditionally creepy tale of the supernatural, it should particularly interest AMNH patrons, since it involves poet Romaine Moreton’s brush with the malevolent spirit of Sir Colin Mackenzie, the notorious director of the discredited Australian Institute of Anatomy, whose building was repurposed to serve as the film archive. For fans of 1980s movies, it is quite amusing to see Bryan Brown turn up as one of the storytellers, but his yarn does not have the archetypal weight of the better installments. Easily, the most emotionally resonant tale is logically the final chapter, whereas the penultimate segment features the liveliest delivery. Oddly, the weakest anecdote, a mere sketch about a traditional aboriginal grandfather’s response to a lunar eclipse apparently inspired the one-sheet, but at least most of the constituent ghost stories hold some sort of deeper cultural significance. Executed with tremendous sensitivity, Darkside is a quiet film that takes its time finding its footing, with some of the earlier stories feeling like warm-ups for the heavier stuff to follow. It is a bit unusual to have a Margaret Mead selection that is so appropriate for Halloween programming, but its concern for indigenous people and oral history nicely fits the festival’s mission. More elegiac than scary overall, The Darkside is recommended for viewers interested in indigenous Australian culture and the ghost story-telling tradition when it screens this coming Sunday (10/26) at the American Museum of Natural History as part of this year’s Margaret Mead Film Festival.